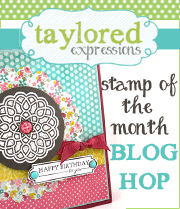 Taylored Expressions Stamp of the Month Club Blog Hop! Hello! 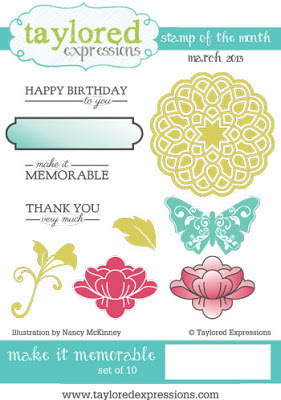 Welcome to a special blog hop we are having this month to introduce you to the new Taylored Expressions Stamp of the Month Club! I'm sure most of you have heard about the TE Key Ingredients Kit Club which includes a 6x6 paper pad, 12 sheets of cardstock, and 5 yards of ribbon all packaged together and delivered to your door each month for $24 (U.S.), $28 (Canada), or $35 (other countries) including shipping! Well, now Taylor is offering 2 new subscription options! The first is the Stamp of the Month! The Stamp of the Month Club includes a new stamp set shipped directly to you each month! These stamp sets are exclusive to subscribers so they will not be available to the general public. The stamp sets will coordinate with the patterned paper in the Key Ingredients Kit Club for those who subscribe to both, but they can also stand alone. The Stamp of the Month can be purchased for a monthly charge of $20 (U.S.), $22 (Canada), $24 (other countries) which includes shipping! The third option is of course of combination of the two clubs called Deluxe Key Ingredients Kit Club! You will get both the Key Ingredients Kit PLUS the Stamp of the Month for a reduced price! This subcription can be purchased for a monthly charge of $39 (U.S.), $45 (Canada), $53 (other countries). Deluxe subscribers also get additional perks like a 10% discount in the TE Store all month long! Well you can't have a blog hop without prizes, right?! We're giving away a March Deluxe Key Ingredients to one lucky winner!!! The winner will be chosen at random from all of the comments left on our blogs between now and Thursday evening at 9pm PST. The more comments you leave the better chance you have of winning! The winner will be announced on Taylor's Blog on Friday, March 15th. What are you waiting for? Hop along to check out the rest of the fabulous inspiration and leave your comments! Gorgeous Card! This set is on my must have list! Very pretty card! Love the background texture and the dimension! Such a pretty card! Love these stamps. Oh My! This card is beautiful!, love your layout..thanks for the chance to win! super sweet... love the pink and green color combo! Stunning!! I love this! This is a really great kit! Awesome job! Gorgeous card! I love your background with these stamps and the colors are so pretty. This card is very well done! Love the new stamp set! THis is just GORGEOUS, Kerri! Unique card layout! I love it! Beautiful card. Love how elegant it looks. Kerri I love these colors together. I need to try and work more with colored ink. It looks so amazing when you see it like your beautiful card. Great use of the new products....I don't know what I would do creativity wise without the inspiration of the Bakers Dozen! Love the background on this pretty card. How very pretty!! I love the dp in this kit! So very pretty!!! I love your use of texture on this card. This card is absolutely gorgeous! Very pretty card. Nice layout. The red and artichoke play off of each other in such a nice way. Sweet card! I like the background very much and the colors you chose. Simply beautiful card. What a great release for March. Very nice! I love how you mixed it up with the quilt diecut as well. I love the idea of a Stamp of the Month! Can't wait to join. A lovely card. Love the white lattice. Very pretty Kerri. Love the butterfly on the medallion image... also love the die-cut background. So elegant. Very, very pretty! What a sweet design! Beautiful card! Love the circles cutting plate, it's perfect with the medallion. What a gorgeous card. 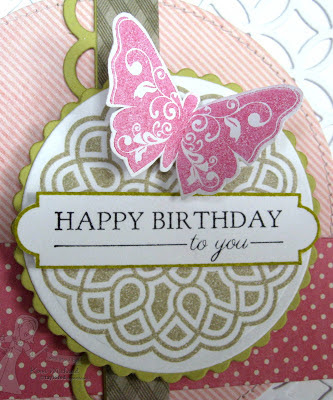 Love the bright butterfly and the embossed background. Lovely stamps and such a fun card.. love the background. Thanks for the layout idea! Very nice! Very pretty card Kerri! I am anxiously waiting for my Key Ingredients kit to come in the mail. What a beauty! Love the die cut white background. Love the layers and the texture from the cutting plate, Kerri! Beautiful, Kerri! Love the elegant white on white background and all the wonderful layers! Gorgeous card and layout, Kerri! The layers are simply beautiful! Such an elegant card!!! K|Love the layout and all the layering! love the background being all white with that die on top! Also love the circles! Beautiful card! I love all the dies and embossing, what a great new set of stamps/dies! I think this is my favorite so far. I didn't order the dies but now I think I must. Your card is just gorgeous. Love this set so much! 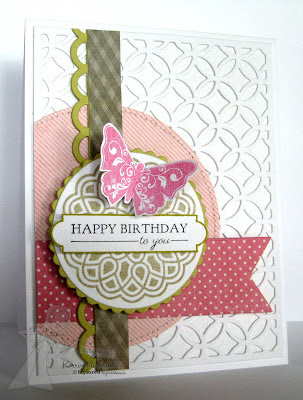 I love the layout and the colors you used on this card. Beautiful card! I love all the layers and the fussy cut butterfly. That is just stunning! Now I need to add that die to my wish list, too.